One last battalion to finish off the 2nd Brigade, 1st Canadian Division. The 7th Battalion, CEF, was originally recruited from militia units in British Columbia. Detail of the formation patch. The red patch of the First Division surmounted by a red semi-circle (red for the middle brigade of the division and the semi-circle for the second battalion within the brigade). Well… What to do next? 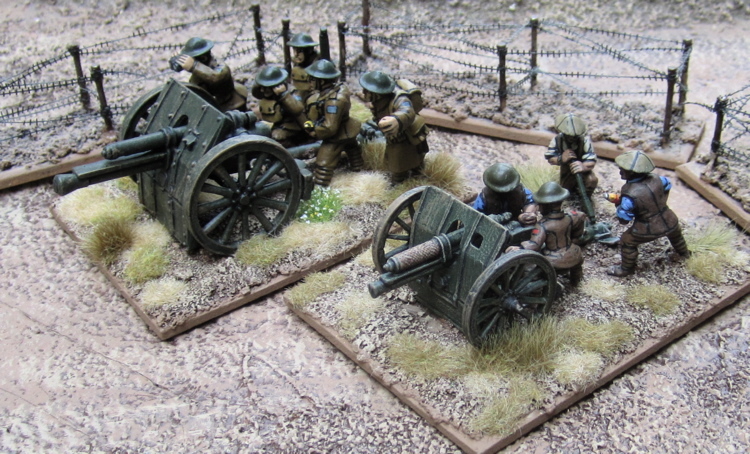 I guess I have a Trench Mortar Battery to paint to truly be finished the 2nd Brigade. Then perhaps on to the 3rd Brigade while I’m waiting for the rest of the miniatures for the 1st Brigade to show up…? 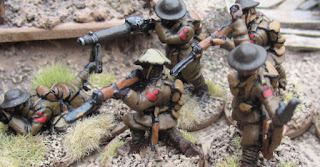 I only have a one full battalion to paint to finish up the brigade plus a few figures for one or two of the other battalions to bring them up to strength. 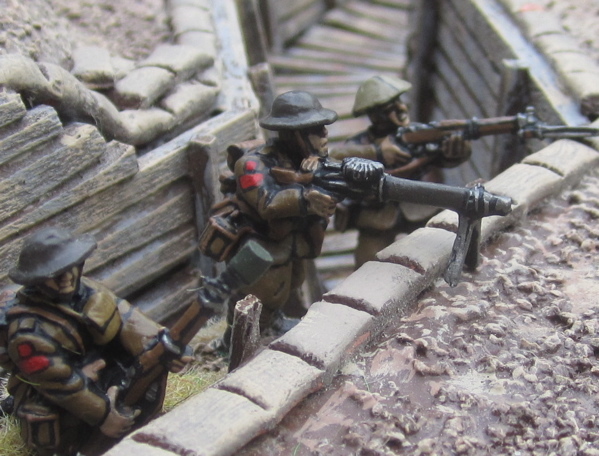 The 8th Battalion, CEF, was originally recruited from 90th Winnipeg Rifles. 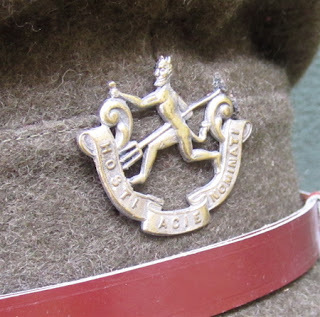 While most of the battalions of the CEF sported cap badges with a maple leaf motif, the 8th Battalion had a cap badge with a running devil with a scroll beneath emblazoned with the motto “HOSTI ACIE NOMINATI” – Named By The Enemy. The enemy, in this case, was the Metis of the Northwest Rebellion of 1885 who apparently referred to the Winnipeg Rifles at the Little Black Devils on account of their dark rifle green uniforms. The 8th Battalion was part of the 2nd Brigade of the 1st Canadian Division. Detail of the formation patch. The red patch of the First Division surmounted by a red triangle (red for the middle brigade of the division and the square for the third battalion within the brigade). I actually have one of the cap badges (the hat is a reproduction). 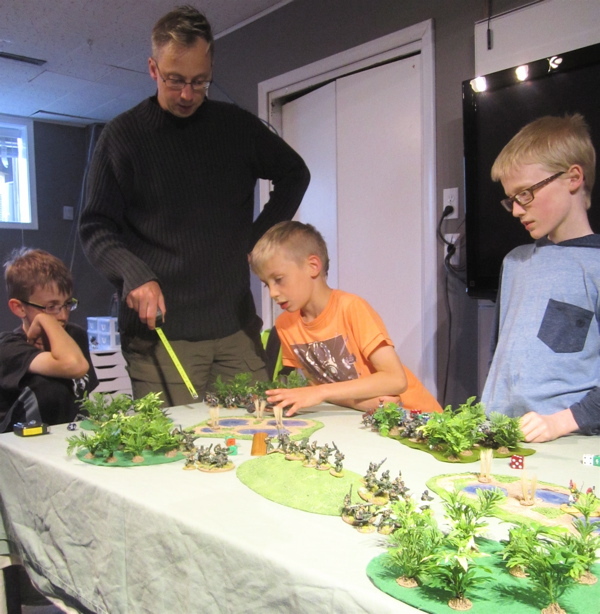 The final battalion in the brigade – the 7th (British Columbia) Battalion. 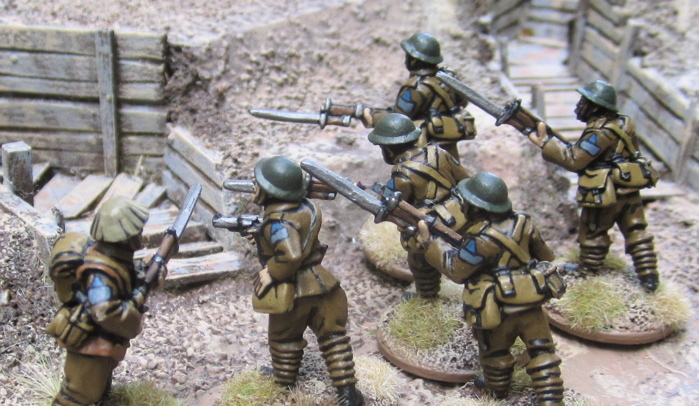 Then… onto the first brigade…? or maybe finishing up some stuff for the third brigade? 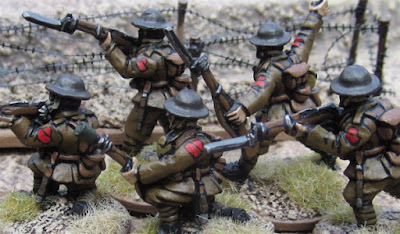 I’m using Wargames Foundry figures for the First Brigade and though I have a few on hand, I don’t have enough for the entire brigade. I ordered enough this past week to finish up the brigade, but I’m not sure if they’ll be here quite quick enough. 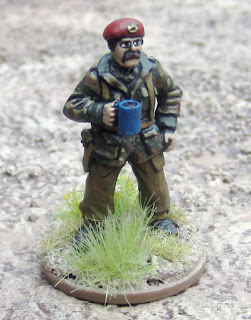 I do have a few figures to finish up for units in the Third Brigade. 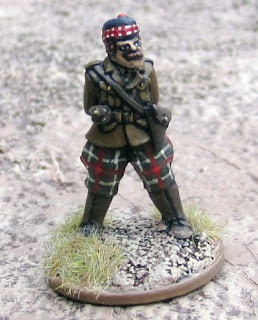 The Third is made up of two units of highanders using the very first miniature I eve modeled and cast, one unit of highlanders from Old Glory Miniatures (which is mostly completed – I just have two or three extras I need to bring the unit up to strength), and a unit of figures from the Foundry. 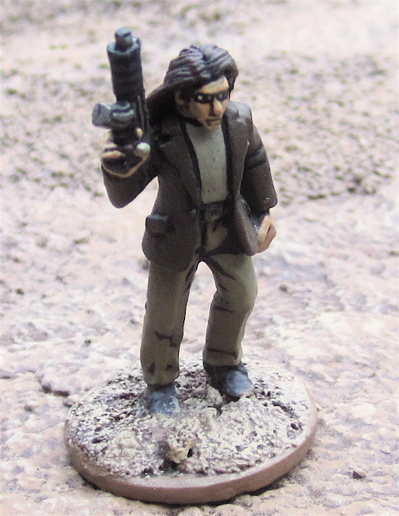 Bad Guy with a gun from Copplestone Castings. 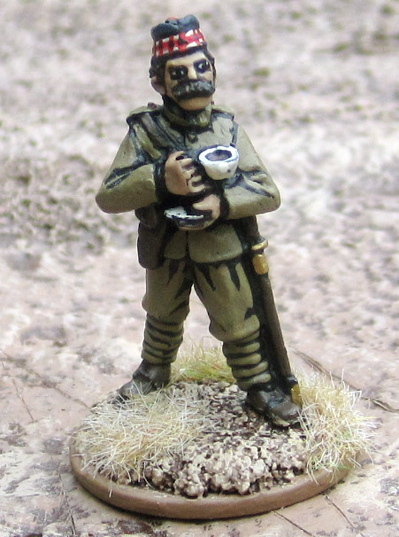 I’d actually painted this chap up ages ago, before getting on with the Great War project. I actually finished him up at the same time I painted Jules and Vincent, but when I went to take a picture of him, I noticed a huge chunk of paint had been scraped off his lapel leaving shiny bare metal!? So I left him on the workbench to fix up. Starting in on the 1st Division – or adding to it, rather, as I already have a few of the units done… or… PART of a few units done… This one, for example, I had painted the officer and one of the NCO-looking guys (holding rifle and pointing) YEARS ago… They’ve been touched up a bit – new colour on the helmet and repainted the formation patch to match the rest of the rest of the troops. The 10th Battalion was originally recruited from militia units in Winnipeg and Calgary. The sailed to England in 1914 as part of the 2nd Brigade, 1st Canadian Division. Detail of the formation patch. The Red patch of the First Division surmounted by a Red square (Red for the middle brigade of the division and the square for the junior battalion in the brigade. There are actually two lewis gunners pictured in the group shot above. 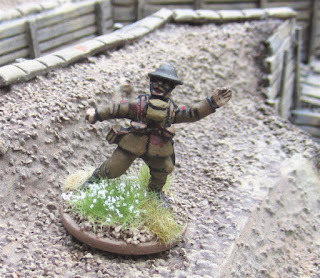 The pack of lewis gunner came with 8 or 10 - of which I only needed four. 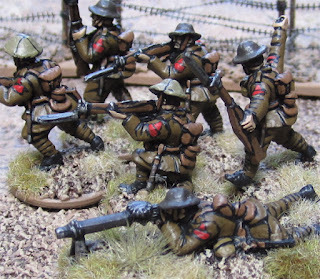 half of the Lewis gunners were prone and the other half were standing with gun out in front of them presumably to be used as though it is braced on something (like, say, the parapet of a trench), as above, when defending trenches. At least Old Glory has a FEW kneeling figures I could add into the mix... one per unit... but at least not ALL of the other figures are standing while the Lewis gunner is prone. The Boy took along all his Orks and the Girl took all her Eldar (plus my old Harlequins – that I painted 25 years ago!). 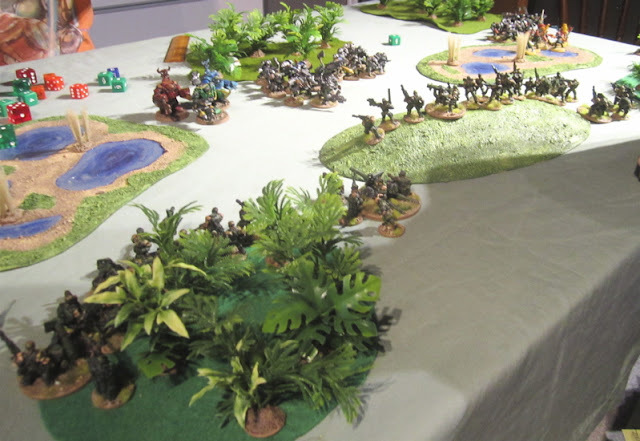 I took a pile of Imperial Guard and figured I’d sort out what I could field once we got there. 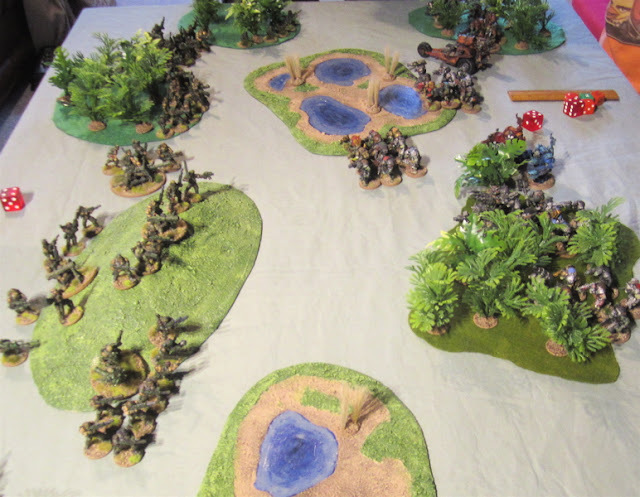 The original plan was to have everyone field whatever they had and I would make up for difference on our side with my Imperial Guard (Aaron has a few Ultramarines, his boys have Chaoe and Tyranids… Yes, I know, Tyranids don’t ally with anyone – we’re ALL food to the Tyranids… but I figured maybe the Orks caught a few they were using as “pets”..). 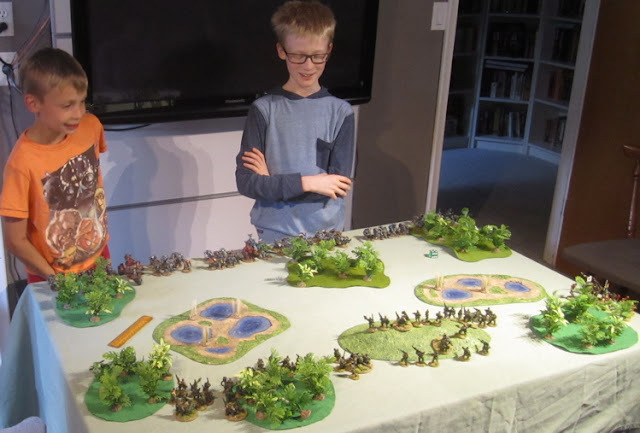 When we got to their place we found one of his boys had taken ALL of their codexes to school… and left them there!? So we had NO IDEA what any of their stats or rules or points were… so we just ended up playing with what me and the kidz brought – which was okay because The Boy had lots of Orks and I had lots of Imperial Guard and so everyone got a few units to play with. 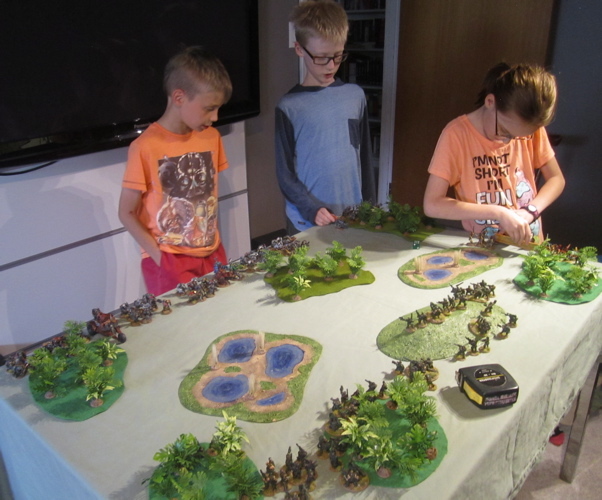 The Boy and one of Aaron’s set up his Orks on one side of the table. I think they had five or six units of Boyz (mostly with sluggas and choppas and one units with shootas), some MegaNobz, some Lootas and Burnas, a Weird Boy, a Warboss and a buggy. On our side I took eht Imprial Guard Copmpany command team. Amanda and one of Aaron’s boyz each took a Platoon Command and two Guard Squads, Aaron took my unit of Ratlind Snipers. The Girl had her Farseer, a unit of five Howling Banshees, and a few of my old Harlequins. It was a smallish table and ended up pretty packed with stuff! 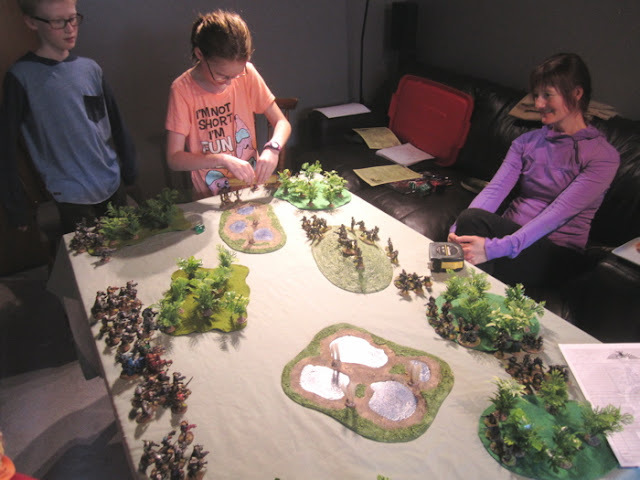 Every single unit and every single weapon has it’s own special rule that we needed to keep looking up… Hopefully by the end of it everyone had a GENERAL sense of how the game is played and were sufficiently motivated to getting back to painting their miniatures! On the Orks second turn the Weird Boy teleported the unit he was accompanying BEHIND the guard lins and shot up one of the squads pretty good! That was a fun moment – unfortunately we had to call the game as it was getting late so they weren’t really able to take advantage of this. Buggy rolled into the swamp and got totally bogged down. 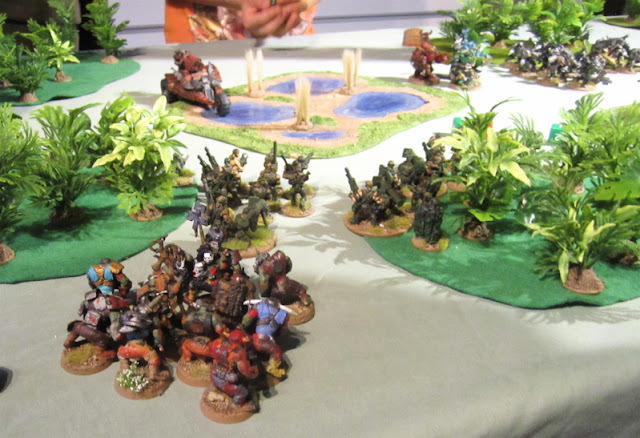 It was a little frightening seeing that swarm of orks tearing across the table and not being able to take out nearly enough of them! I think overall The Girl was a bit disappointed with the performance of her Eldar, but I pointed out that the Eldar units seem to be pretty specific in what they do and need to be used in coordination with other Eldar units – the Guardian defender may be boring – but they might give her force a base of fire that could weaken the orks enough that when her howling banshees DO charge in they can just mop up what’s left… I’m pretty sure her Farseer could have been used far more effectively… but she had no idea how to use it and nor did I (as I currently have no psykers in my Guard force I had little idea how they work at all, let alone how to best use an Eldar Farseer). I think everyone had some fun. Hopefully the next game will go quicker. 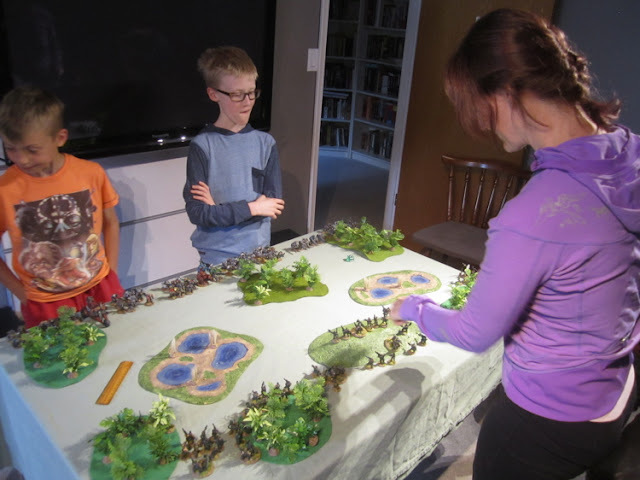 Hopefully it will have inspired them to get back to painting (I refuse to play with OR AGAINST unfinished figures!) and maybe reading the rules (in addition to the fluff!). 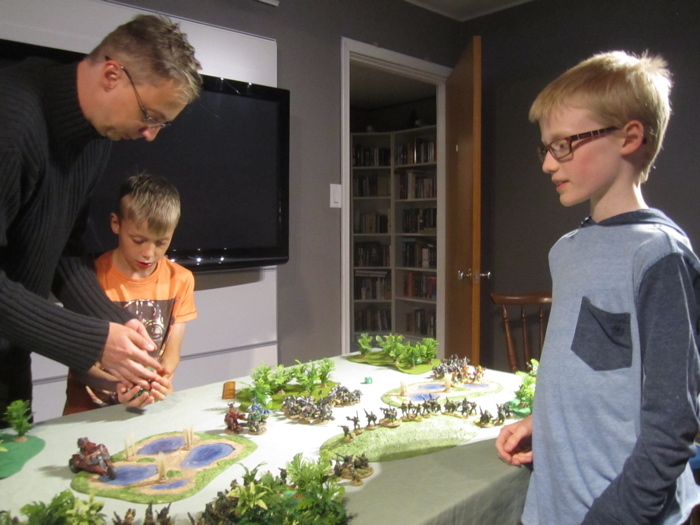 40K isn’t my favourite miniature wargame – not even in the top 20… but it was fun enough and I’ll play it again – especially with these guys! 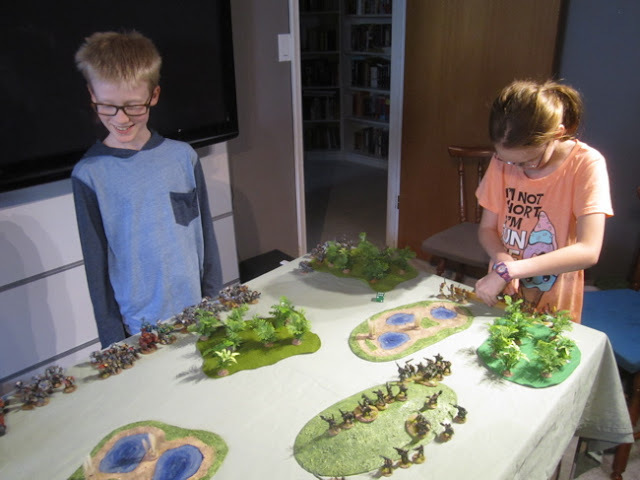 I hope I can get them playing some historical games some time... maybe Bolt Action...? Finished up another battalion of Great War Canadians – I should have them posted shortly. 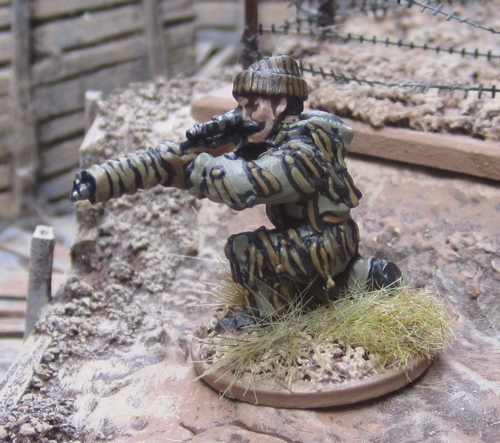 All the miniatures for the 9th Brigade are from Brigade Games. 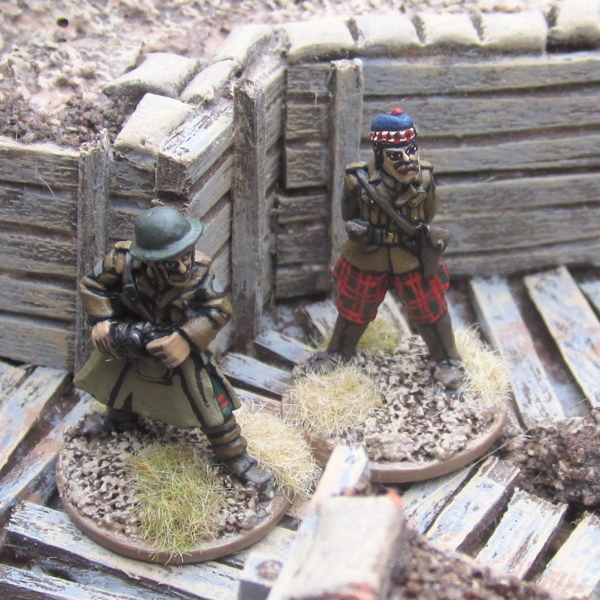 Onto the First Division I think… or maybe some Germans…? The 58th (Central Ontario) Battalion, CEF was mobilized at Niagara-on-the-Lake, Ontario in April 1915 and joined the 3rd Canadian Division as part of the 9th Brigade in early 1916. The miniatures for the 58th Battalion are all from Brigade Games -as are all the figures in the 9th Brigade. Detail of their formation patch - The Grey patch of the Third Division surmounted by a Blue triangle (blue for the junior brigade of the division and the square for the 3rd battalion in the brigade). Then onto the 1st Canadian Division! 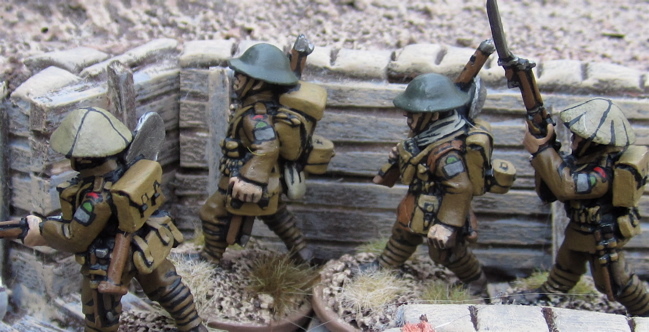 These guys don’t fit into any of the regular battalions I’m working on for the Vimy project. 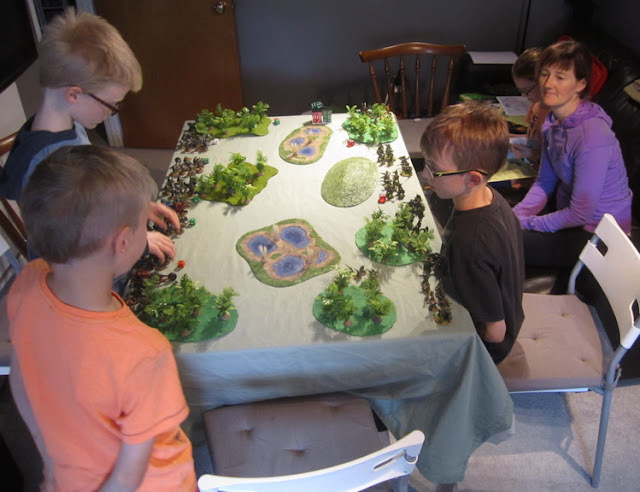 I picked them up to use with the other guys when playing skirmish level games. Sniper from Great War Miniatures. I have finished up the 58th (Central Ontario) Battalion, CEF, and with it the 9th Brigade, and with that, the 3rd Canadian Division! I’ll have separate posts with those later today. The “Vics” of Montreal was the junior battalion of the 9th Brigade in April of 1917. After the battle of Vimy Ridge the survivors were split up and absorbed by other battalions and the 116th (Ontario County Infantry) Battalion took their position in the Brigade. The figures in this battalion, as with all the figures in the 9th Brigade, are from Brigade Games. Detail of the Vics formation patch. The Grey patch of the Third Division surmounted by a Blue Square (blue for the junior brigade of the division and the square for the junior battalion in the brigade. One more battalion (58th Central Ontario) to finish up the brigade – and the division! These guns are from Renegade Miniatures. I like renegade miniatures. They’re a tad on the chunky side, but they are solid (and durable!) and easy to paint. The gun was easy and straightforward to put together. 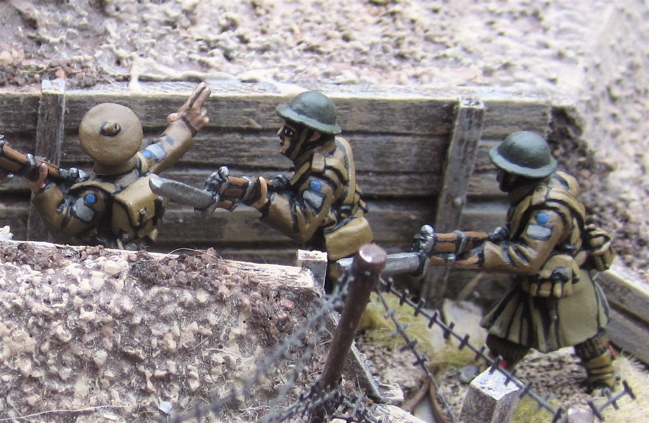 One of the last two battalions (58th or 116th) of the 9th Brigade… Then it’ll be on to the first Division… or some Germans!? This past week my daughter turned 10. 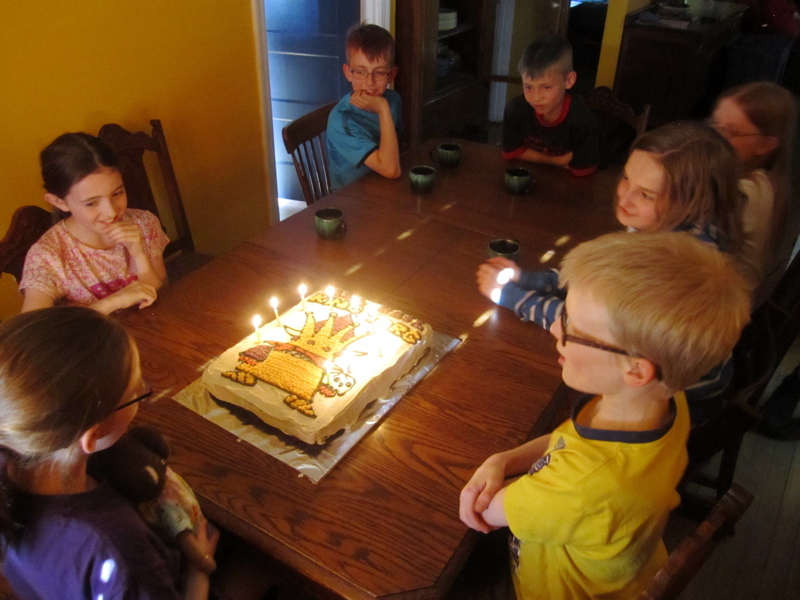 To celebrate we arranged a little party for this weekend. 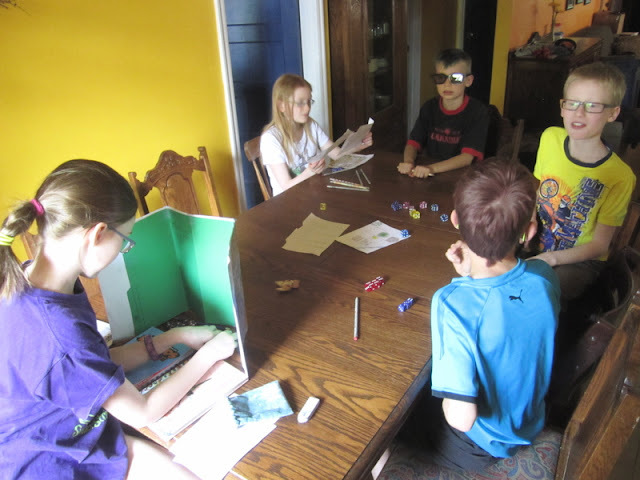 She started off around 1pm running a game of Kobolds Ate My Baby for a few of her friends. 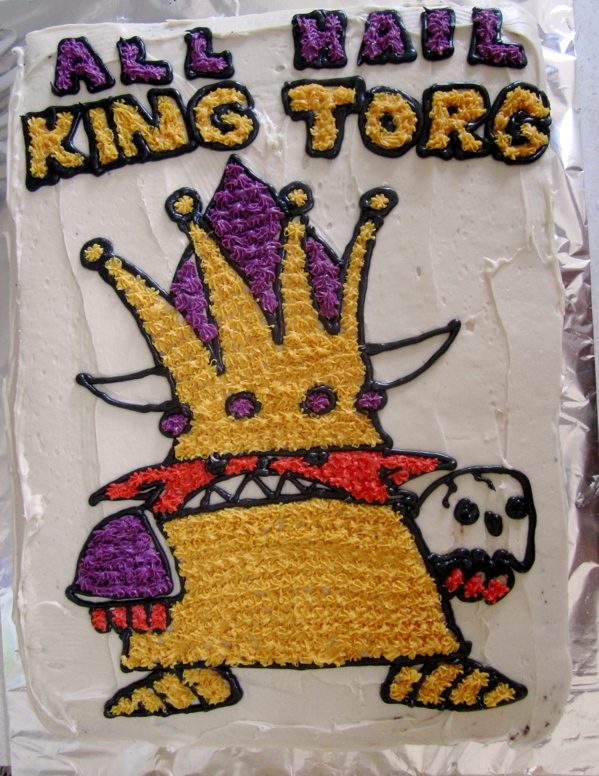 The adventure involved the Kobold player characters trying to scrounge up ingredients for King Torg's Birthday Cake (ALL HAIL KING TORG!). One of the ingredients was "Human Babies". 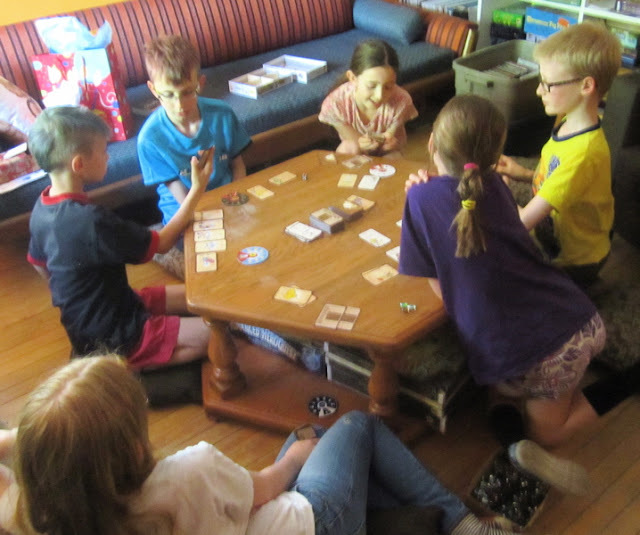 Then another friend showed up and there was an epic game of Munchkin Legends (bit of a John Kovalik theme going on here...). 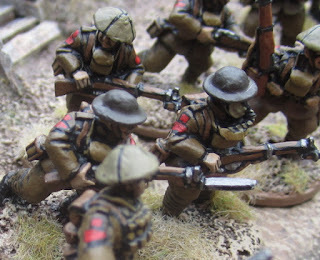 All of the figures used of the 7th Infantry Brigade are from Great War Miniatures. Princess Patricia’s Canadian Light Infantry was raised in 1914 by Montreal businessman and Militia officer Andrew Hamilton Gault. The regiment was named for the current Governor General’s Daughter, Princess Patricia of Connaught. It was apparently the last privately raised regiment in the British Empire. Initial recruits were mostly made up of British ex-servicemen. The Regiment preceded the rest of the Canadian Expeditionary Force overseas and joined the 80th British Brigade and were the first Canadian unit to see action in the Great War. A year later in 1915 the regiment joined the newly formed 3rd Canadian Division as part of the 7th Canadian Infantry Brigade. This was the last unit I had to paint to finish up the brigade. 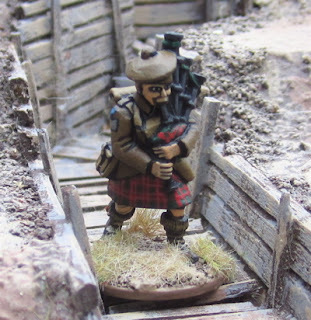 Also in the Brigade were Royal Canadian Regiment, 49th (Edmonton) Battalion, and 42nd Canadian Infantry Battalion (Royal Highland Regiment of Canada). As I already have the 8th Brigade finished, I need only finish up three more regiments in the 9th Brigade to finish the 3rd Canadian Division! Detail of the formation patch. The formation patch was a grey rectangle for the 3rd Division, surmounted by a green semi-cirle (green for the senior brigade in the division, semi-circle for the second battalion within the brigade). The PPCLI was one of few battalion of the Canadian Expeditionary force that wore a cloth shoulder title to distinguish their unit – the little red arc above the formation patch which would have the white letters “PPCLI” on it. I’ll probably post a picture of the entire 7th Brigade. 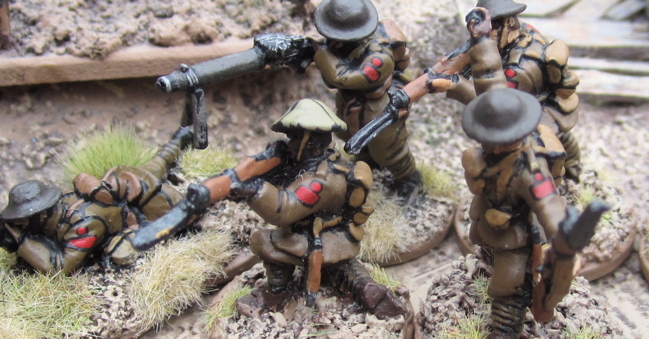 Next I’ll get to work on the three remaining battalions of the 9th Infantry Brigade to finish off the 3rd Division and maybe some of the guns I have...? I guess I should work on some Germans at some point!